There is a heartening finding in my recent national poll of American public attitudes: A majority of Americans support taking in refugees from Middle Eastern conflicts, assuming that they are screened for security risks. This is so despite political exploitation of horrific terrorism in the name of Islam. Yet, Americans are deeply divided on whether or not the United States has a moral responsibility to help refugees from conflicts in the Middle East. The American moral ambivalence needs explanation. First, there’s good news for those looking for signs of American compassion. Even in the middle of a U.S. presidential campaign that has been breathtaking in its exaggerations and racism, with devastating terrorism providing fuel, 59 percent of Americans say they are ready to accept Middle East conflict refugees, and 56 percent express openness to Syrian refugees specifically. These numbers increase dramatically among millennials (18 to 34 year olds), with 68 percent saying that they are supportive of taking in refugees from Syria and other Middle Eastern countries. Not surprisingly, and as on many other issues, there is a deep divide across party lines, with 77 percent of Democrats expressing openness compared to 56 percent of Independents and 38 percent of Republicans. Among Trump supporters, only 22 percent are supportive, compared with 80 percent of Clinton supporters and 81 percent of Sanders’. This majority could be larger, if it weren’t for exaggerated fears: A plurality of those who oppose receiving Middle East war refugees (46 percent) name concern about terrorism as the principal reason. Yet, Americans overestimate the terrorist threat emanating from refugees. When asked to estimate the number of refugees charged with terrorism since 9/11, only 14 percent say it’s fewer than five, while 28 percent estimate it to be 100 or more. The actual number is 3. But there is another side to the story. 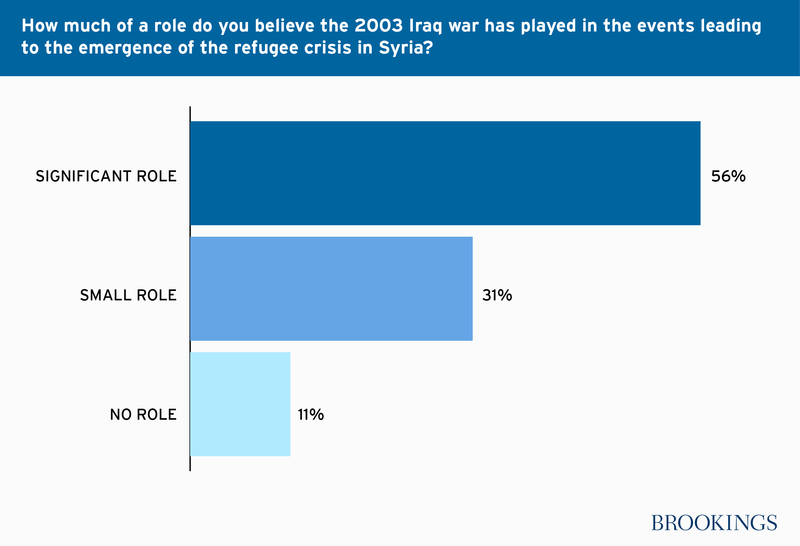 Americans are far more divided on accepting moral responsibility to help Middle East war refugees. They are of course split along party lines again, and millennials are more willing to claim moral responsibility than the rest. But only 49 percent of Americans feel they have a moral responsibility to help Libyan refugees, 51 percent for Syrian refugees, and 54 percent for Iraqi refugees. These numbers are puzzling. First, it’s noteworthy that this question was simply about “helping” refugees, not about accepting them into the United States—something that inevitably triggers security fears among many. Second, in a separate question about American attitudes toward the Golden Rule (spelled out as treating others as you want them to treat you), over 80 percent of Americans, across party lines, said this is either extremely important in their lives or the single most important principle in their lives (ranking it 8-10 on a scale of 0-10). 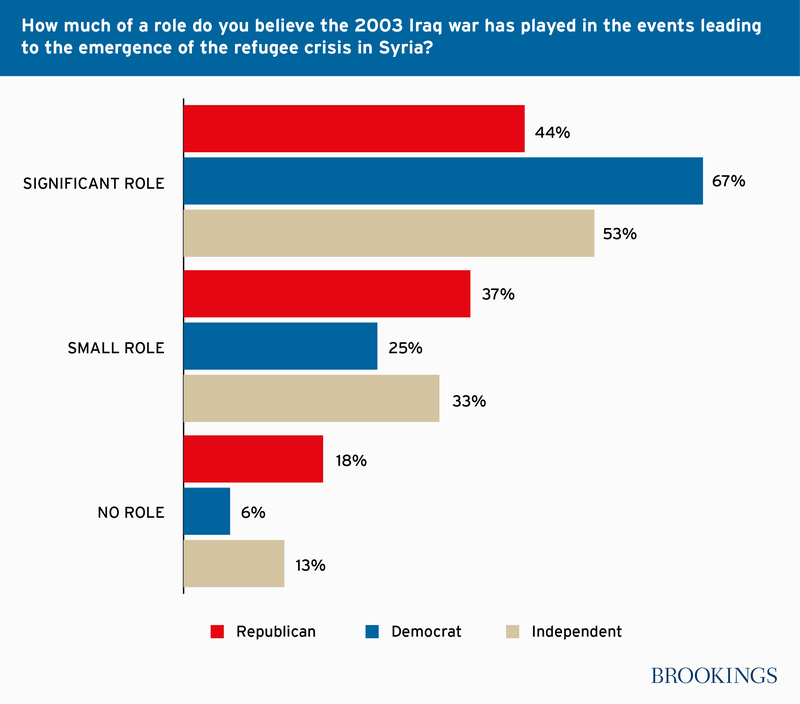 Third, and perhaps more importantly, a majority of Americans believe that the Iraq war played a significant role in the events leading to the Syrian refugee crisis, while only 11 percent said it played no role. This last point goes beyond a humanitarian obligation, as it ties events for which the United States was at least partly responsible to the refugee crises. In fact, even in the middle of our political campaign, the public and politicians attribute the U.S.-led war in Iraq and its consequences to bad decisions by U.S. presidents: Democrats blame George W. Bush for the war, many Republicans blame President Obama for his decision to withdraw most American forces in 2011, and Donald Trump blames both. The upshot is that even in the midst of the political polarization in the U.S. presidential campaign, the blame for the failed Iraq war and its consequences has rested with American presidents. It’s all the more surprising that nearly half of the American public doesn’t see in this a moral obligation to help refugees from Syria and, to a slightly lesser extent, Iraq. Here, some of the blame may rest with political leadership. Of course, security concerns will always be paramount to most Americans, and political leaders must address these issues first and foremost. This is particularly true in times of real threats, the likes of which we witnessed in San Bernardino and, two weeks after this poll was taken, Orlando. But the public sees itself as moral (guided by the Golden Rule), it sees an American responsibility in the terrible events that have led to the Middle East refugee crises, and it exaggerates the link between terrorism and refugees. Yes, people want to be assured about their security, but they also need to be reminded of the facts, and of their perceived moral obligation. President Obama’s reluctance to wage more failed wars in the Middle East is understandable, and in any case, the ultimate solutions to the crises in Syria, Iraq, Libya, and elsewhere in the Middle East do not rest solely with the United States. However, Washington has an immense obligation to help refugees more than it has, not only because the United States remains the richest and most powerful country in the world, but especially because it played not an insignificant role in the events that led to the emergence of millions of Middle East refugees in the past few years. The numbers tell the story. In the case of Syria alone, there are 4.8 million refugees in the region, according to Mercy Corps. There are over 2.6 million refugees in Turkey, 1 million refugees in Lebanon, and roughly 637,000 in Jordan. These numbers are extremely large compared to the size of these nations. The United States has absorbed only about 3,500 Syrian refugees. This number is even small compared to other Western countries, with the European Union taking in about 150,000 refugees and Canada—whose population is one-tenth the size of America’s—admitting 28,449 Syrian refugees since November 2015. Of course, President Obama is facing pushback on accepting a large number of refugees. But setting a low target is a mistake, and not defending it more forcefully is an even bigger mistake. My recent poll results make the case: When told that the Obama administration aimed to accept 10,000 Syrian refugees this year and asked, in an open-ended question, how many they believed the United States should sponsor and resettle in 2017, the median number was also 10,000 (15,000 for Democrats and Independents) while the mean was much larger (over 50,000). This suggests that the number set by the White House becomes the threshold for public estimation, and that a greater burden rests with the White House and other political leaders for setting expectations. Of course, given the rigorous security screening and limited allocated resources, the United States has had a difficult time even implementing the modest target (so far, about 3,500 have been accepted). But there is much evidence that—although Americans are deeply divided, especially in an election year—the American moral sense of self, and the linking of American actions in Iraq to the Middle East refugee tragedy, transcend party affiliation. This suggests that despite the terrible toll and horror of terrorism, Americans can be persuaded to aim for much higher moral ground.